Sign up as either a full team or an individual. Sign up as an individual if you are paying for only one person. You can still mark your team name or team members on your sign up form. If you don’t have a team, we will create teams from other individuals. Per-person sign up is $800. Sign-up as an individual here. Sign up and pay as a team. Team sign up is $3200. Sign-up a team here. We use PayPal for quick secure payments by credit card. Please contact us for other payment options. Thanks to all who participated in the 2018 Tournament! We raised approximately $28,000, which will go towards the Pleasant Valley Project. 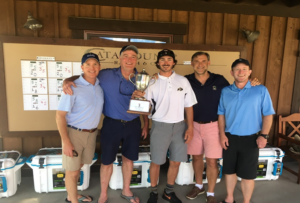 Congratulations to Josh Rudolph, Scott O’Sullivan, Patrick Dean, Andrew Bradley, and Guide Charlie Smith of Team Chuck’s Purple Worm for taking First Place in the 2018 Golf Trout Tournament.